Indianapolis, IN (May 21, 2018) – The Roller Skating Association International is pleased to announce that Jeff Couey, owner of Sparkles Family Fun Centers in Georgia, was re-elected by the RSA members for a second two-year term. While serving as the Association President from 2016-2018, Couey made significant strides in developing business partnerships with organizations such as ICEE, FetchRev, TrustWorkz, CSA Business Solutions, ADP, PartyWirks, Protect Youth Sports, Schwan’s and more. Ties with national partners Pepsi and JBL Trinity Insurance Group are stronger than ever and members now have access to two new software programs that are instrumental in growing their business: My Skate Repair (www.myskaterepair.com) and the Kids Skate Free Program (www.kidsskatefree.com). President Couey’s family has been in the roller skating industry for over 55 years. They became members of the RSA in the mid-1960s, then called the Roller Skating Rink Operators Association. Jeff’s parents started their roller skating business in September of 1959, just months after Jeff was born, thus allowing him to grow up in the industry and carry on his family’s business. A National Champion Speed Skater in 1976, Couey went on to participate in the World Event. In 1981, Couey purchased his first skating center from his father and later inherited his second location, Sparkles of Kennesaw, in 2001. Together, he and his wife, Ava Couey, remodeled both locations which are now known as Sparkles Family Fun Centers. The Couey’s work consistently with their management team to bring progressive ideas to fruition and create business plans to make their operations successful. President Couey served on the Roller Skating Foundation Board for three years, and continues to do so as the RSA President, as well as held a leadership role in RSA Section 13 as vice president. Couey continues to sit on the Board of Directors for his local bank and ALOHA for Aging. He also serves on the Executive Board at his church. With many years of board service and leadership under his belt, Couey has been able to push the initiatives he wanted to see put into place and bring his own progressive and innovative ideas to the industry. As part of the RSA’s Strategic Plan, a goal was set to start a new competitive roller skating program. During Couey’s tenure, the United States Roller Speed Skating Association began and is one of the fastest growing sports organizations in the industry with the American Roller Speed Skating Championships to take place in Colorado Springs, Colorado on June 14-18 and sponsored by Comcast with $10,000 in prizes. The Roller Skating Association is excited to continue working to carry on President Couey’s vision for the roller skating industry and would like to congratulate him on his re-election. The Roller Skating Association (RSA) is a trade association that serves commercial (for-profit) skating center owner/operators. It also serves those involved in various facets of the roller related industry such as teachers, coaches, manufacturers, distributors and other elements of the family entertainment industry. It seeks to promote the success of our members through education and advancing the roller skating business. For more information about the Roller Skating Association International, please contact: Jim McMahon, Executive Director, at 317-347-2626 Ext. 104 or jmcmahon@rollerskating.com. September is First Responder’s Month at Sparkles! For the entire month of September, Sparkles of Hiram will be offering FREE ADMISSION for all Policeman, Fireman, EMT’s, Dispatchers,and Paramedics and their Families! Valid during our Tuesday & Thursday Sessions from 4:00pm-8:00pm and our Sunday Session from 2:00pm-7:00pm. Skate Rental is $4.00 additional if needed. Labor Day All Night Party in Hiram, Ga.
Summer is finally over & our Labor Day All Night Party is finally HERE. This is the LARGEST Teen Party we host all year long, we suggest you get here early! Sunday, Sept. 4th. Doors Open @ 7:30pm. GET READY TO GET WILD!!! $25 admission covers entry, skate rental, slice of pizza and one soda. This Labor Day we are offering Half Price Admission ALL DAY LONG! That’s right, only $3 Admission! 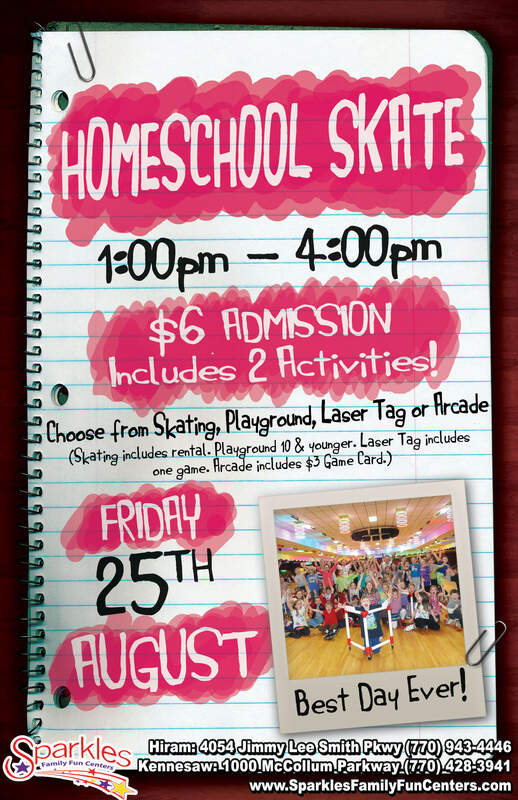 Join us Friday, August 25th for our Homeschool Skate! 1:00pm – 4:00pm. Only $6 for TWO ACTIVITIES! If you have any questions or if you would like to sign up your child/group for this awesome private event contact Jessica Cranford at JCranford@sparklesfamilyfuncenters.com or call (770) 943-6080. More details below. Click the flyer to enlarge. 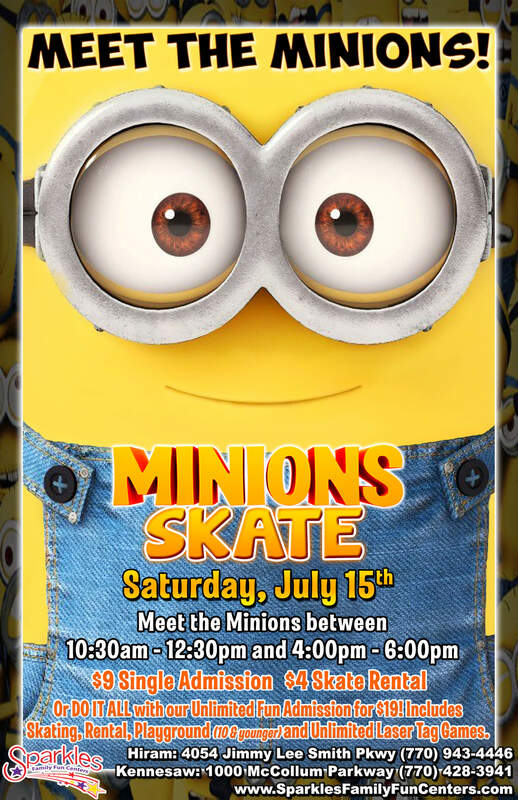 from 10:30am – 12:30pm and 4:00pm – 6:00pm at our MINIONS SKATE! We are going to have a ton of Minion Fun, Games and Prizes throughout. Check out the details below. Tax Free Weekend Specials in Hiram, Ga. This Tax Free Weekend enjoy Buy One, Get One Free Admission ALL DAY Friday and Saturday! KICK OFF Summer this Memorial Day weekend at our ALL NIGHT SUMMER PARTY ! 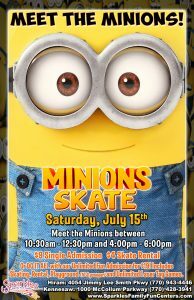 Skate and have FUN at Paulding’s Largest Teen Party! 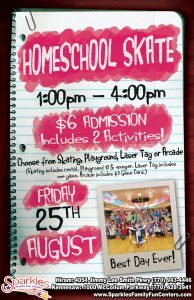 Sunday, July 26th is Parent’s Day at Sparkles! Adult Night in Hiram, Ga.
Sunday Night, November 8th is our next Adult Night Skate! Skate to the BEST SKATE SONGS from the 70’s till now!! !